The Human Stained: Chelsea Mosgrove mimics the tragic pose of Agnes, who some believe haunts the Golden Gate Villa. * Built in the middle of a flood plain, using the labor of the people it was stolen from--creepy! * Morphed into a summer destination for the rich with the advent of the railroad, which was built on the backs of exploited Chinese laborers--creepy! * Summer getaways built on sacred Indian burial grounds--way, way creepy! And people wonder why we have a local legend that the fog that rolls in all summer is the cumulative spirit of all those who have been wronged here. Though we're all pretty much hardened skeptics around here, even we have to wonder if perhaps the past does have a way of catching up with the present. That's certainly how one local, who we'll call Renee for the purposes of this story, felt a couple of years ago when she moved into a turn-of-the-century home near Ocean Street extension. As Renee recalls, the previous owner did mention having sometimes seen "an old woman rocking herself in a chair near an old stove," but Renee thought little of it, until the day she threw a birthday party and a psychic friend of hers claimed that the spirit of a pioneer lady was hanging out in the house--a spirit her friend subsequently tried to contact. Renee speculates that this attempted contact opened some kind of door, because shortly thereafter, she says, really weird stuff started happening. "TVs, computers and lights turned themselves on," she says. "My 2-year-old son, Gregory, started screaming every few hours every night. And each time I went into his room to comfort him, I'd find the same nursery rhyme book on the floor where it couldn't have just fallen by itself." Things came to a head the night Renee found Gregory crammed in a corner of his crib, crying, "Look! There's a mommy!" This is the moment Eddie Murphy once described in his bit about The Amityville Horror as "Too bad we can't stay!" But Renee was already in, and she didn't want to be driven out by spooks. So who you gonna call, if Bill Murray doesn't live in town? Renee turned to Carmen, a no-nonsense sort of gal with a huge raspy laugh who claims to have a talent for doing what she calls "house blessings"--basically, exorcisms, Santa Cruz-style--but prefers to remain anonymous for fear of being contacted by every weirdo in town. Of which, she notes, there are plenty. As Renee recalls, Carmen showed up and led some ancient Jewish chants that reverberated through the whole house. "The neighbors must have thought I'd joined a coven cult," jokes Renee, who was less amused when Carmen declared that it wasn't so much Renee's house that was haunted, as Renee's son, Gregory, not to mention the whole area surrounding the house. "Carmen told me Gregory was attracting this weird energy. She made me put rock salt over the windows and doors and take a candle and make a sign of cross," Renee says. For the next year, all stayed relatively normal chez Renee--and then things turned majorly weirder. "Lights, radios, even the shower came on by itself," says Renee. "I went in the bathroom and this blue flared light went "Wuh,wuh,wuh!' and then the light bulb cracked. My husband, who hadn't believed in any of this up until then, was upstairs with our son, when Gregory flew back three feet, as if he'd just been pushed." Summoned again, Carmen proclaimed that with the house being "at a gateway," and both Renee and Greg attracting this kind of energy, they'd forever have to be doing "tuneups" to keep it clear it. Desperate, Renee contacted Ishana Bai, a certified practitioner of the Yuen method of Chinese Energetics, a system that claims to identify and instantly eliminate layers of negative influence. Bai promptly told Renee the house was haunted by an old lady who was looking for her murdered husband. The husband, said Bai, had karma with Gregory from a past life, but Gregory was protected by a spirit dog, which was what had pushed him away from the old lady, who did not always have "good intentions" toward Gregory. Figuring that things were only getting worse, Renee moved her family and to date she says none of them have experienced any more weirdness. Reached by phone, Carmen says what people see largely depends on whatever they find acceptable to see. "Someone will say, 'Oh my God, there's an angel with 20-foot wings in my living room,' and all I'll see is sparkles, like when you look up too fast. People say, 'Can you see the angels,' or the Indians or whatever, and I'll say no, but that's OK. Some people have a need for Cecil B. de Mille productions. That doesn't invalidate what they see." Carmen, for her part, reports seeing an otherwordly presence as sparkles, points or orbs of light. "I don't see angels or headless horsemen," she says. "I'm really boring." She classifies hauntings into several distinct categories. "When people hear voices, they're often hearing their own negative stuff, but instead of dealing with it themselves, they get some Gypsy to charge them to get rid of their own stuff," says Carmen, breaking into one of her famous smoker's laughs. "And when people see the Virgin Mary, it's probably because so many people have already meditated upon and embued it with power. That's what we call an 'aggregor.' It's the same when people see a vision of the devil. Good or bad, aggregors are indifferent." Then there are what Carmen calls "echo effects" from sites where really highly charged emotions or passions have played out. "It's like radio waves, which never dissipate, so that Elvis is still singing somewhere in space. Who's to say that energy doesn't bounce back and someone hears it?" she asks, noting how battlegrounds, crime scenes and burial grounds are often connected with hauntings. "That's because these sites are so emotionally charged," she explains. "Rarely are people haunted by some grandmother baking apple pie, because there wasn't enough passion in the sauce to remain there." Well, unless Grandma was poisoning the sauce. But that's probably another story. Last but not least, Carmen describes "energy lines" or "gateways" which are said to exist around sacred sites such as Ocean Street extension. Carmen cites the case of the 80-year-old Brookdale Lodge, which lies between Ben Lomond and Boulder Creek and is famous for the ghost of Sarah--the young niece of the hotel's original owner, who drowned in the creek that still flows through the aptly named Brook Room. Carmen reports that a friend who used to bartend at the fabled lodge and can "see" really well is convinced that the place is a gateway where "the veils are really thin." "It cracked her up what came in," Carmen laughs. This theory is seconded by Jennifer Gilbert-Soto, the daughter of the hotel's current owner, who once had a Sarah sighting herself. "I heard old-time music, people laughing and clanking dishes, and thought someone had broken into the Brook Room. But when I went in, all was silent," she says. "Paranormals who've visited our lodge have asked if we want to get rid of Sarah, and we say no. They've said she's looking for her mom and family and wants to stay here, but that there are many other spirits here, too." Indeed, since the Lodge renumbered Room 12A as Room 13 (supposedly because people reported hearing strange things in there), Gilbert-Soto reports that "people actually request it and deliberately take their Ouija boards in there." While a haunted hotel may make a great vacation getaway, Carmen recommends that people who permanently live in such transmission zones put up some sort of deflection system. "Vibrations bend vibrations, so you can create your own echo effect," says Carmen, who personally uses chants to redirect such energy. One place those deflection systems have been seriously out of whack--at least if local legend is to be believed--is the Golden Gate Villa on Beach Hill. 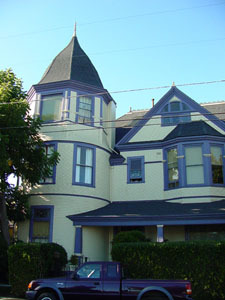 According to historical records, this beautiful butter-yellow Queen Anne with the orchid trim, high hedge and fairy tale turrets was the site of a gruesome murder-suicide 96 years ago, leading many to speculate that it's still haunted. But why and by whom? Entering the house even on a particularly warm fall afternoon, one is immediately struck by a sudden coolness in the air. However, it's hard to tell if that's a sign of an otherworldly presence, or just good insulation. In any case, that's instantly replaced by a feeling of great warmth upon meeting Patricia Sambuck Wilder, who bought this fabulous house in 1967, and has owned and cared for it longer than anybody else. A former fashion model turned interior designer, Wilder's passion for restoring historical homes resulted in the villa being entered into the National Registry of Historical Landmarks in 1975. But for the first four years she owned the house, Wilder, who was born on Halloween, didn't know about the gruesome double tragedy that left the original owner, Maj. McLaughlin, and his stepdaughter Agnes, dead on the second anniversary of the death of the major's wife in 1907. "I've never seen an apparition," says Wilder. "Not that it doesn't exist--I wouldn't challenge that, and I do believe in energy." Wilder says that over the years, the tenants of this 23-room, 10,500-square-foot home with a carriage house, 23 stained glass windows and seven fireplaces--plenty of room for a being to hang about and keep warm--have had different experiences, most of them reputedly with Agnes. Seated in a throne-like chair with gilded edging, beneath a gorgeous chandelier, Wilder says she believes in good as well as bad hauntings. "This house has positive vibes, a very good energy, so whatever spiritual force is left from the McLaughlins is good," says Wilder, who believes she received otherwordly direction in choosing colors to paint the house. "And sometimes, when I've been cleaning and vacuuming, I've had the feeling that someone is watching me, but nothing frightening," she says. Wilder recalls how one time she was giving a tour of the house and a man asked, "Have you ever seen a ghost?" To which a woman in the group answered, "They'd never show themselves to her. They wouldn't want to scare her." "But I wouldn't be scared," she says. "It would almost be an affirmation of the life beyond in which I believe." 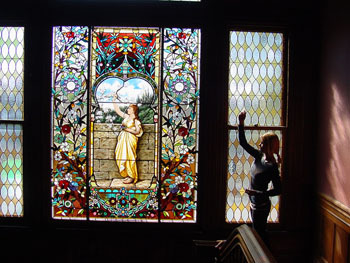 A full-length jeweled stained glass window illuminating the staircase to the second floor portrays McLaughlin's ill-fated stepdaughter Agnes, stretching to pick a branch heavy with apple blossom--a pose that Wilder's granddaughter Chelsea Mosgrove mimics for the camera, before setting the spooking record straight. Mosgrove, who has lived in the house all her life, scoffs at the notion that the Golden Gate Villa is haunted. "I've never seen or felt anything, except a lot of love, which my grandmother has put into this house," says Mosgrove, praising Grandma Wilder as a "fantastic artist" who has reupholstered old furniture and poured all the paint herself. "What about the Sunshine Villa, up the road?" Mosgrove asks. "There are stories of a man killing people and keeping their heads in his room until the stench got so bad they called the police. Now that's freaky. But this house? A lot of it is people hearing stories, wanting to believe in them and coming here and taking freaky pictures of my grandmother from a weird angle and wanting to keep the haunted myth alive." Fair enough. But exactly what did happen in this house anyway? As Wilder tells it, Maj. McLaughlin, who adopted Agnes at age 3, built the house as a summer retreat with money made from his mining ventures, moving the family in when Agnes was 17. There the reclusive blonde debutante lived for 17 years, impressing the locals with her beauty, which was mostly glimpsed when she exited her carriage with her perfumed pet dog, en route to Mass at the Holy Cross Church. Indeed, on the day of her untimely death at age 34, Agnes went to church as usual, then came home, lay down and loosened her corsets. At which point her 57-year-old stepfather came in and shot her in the temple with a .44 caliber handgun, before taking a fatal dose of cyanide. "Agnes lived until 6pm that night," says Wilder, noting that Agnes' fiance Sam Rucker, a former mayor of San Jose, accompanied both bodies by train all the way to New Jersey, where they were buried behind the church where the major had married Agnes' mother. So why did the major kill himself and Agnes? Despite being at the center of a huge financial scandal involving a four-year, 1,000-man, $12 million project to drain the Feather River for gold, the major remained quite wealthy. One of the few men to publicly challenge Wyatt Earp, McLaughlin then turned to politics, before becoming the chair of the Republican State Central Committee and helping to carry the state for President McKinley in 1896, though he allegedly declined a seat in the cabinet and requests to run for governor of California. The gossip at the time was that the major's motive was his guilty passion for the lovely Agnes, a rumor that seemed to many to be confirmed by his last letters, in which he wrote, "I love her so, and so I take her with me." "The major was undoubtedly possessive of Agnes, but he adored his wife," she says. "The story of why he killed her has always been cast in the negative, but why can't people think in a different light? Agnes was so little when the major married her mother that she became his child, he cared about her only in that way." To Wilder's mind, Agnes' spirit lives on in the house as a positive force, an angel that is protective of the house. Wilder, who recently survived a bout with bone cancer and is looking for the right person to take the house on, admits to having had nightmares of seeing someone paint it horrible colors and destroy it. They'd better not. "There's so much of me in this house," says Wilder with a smile. "I've owned it longer than anybody else, So I definitely plan to haunt it. I will definitely watch you guys." House on Haunted Hill? : The Golden Gate Villa on Beach Hill is one local house said to be spookilicious. 'It's an interference. No one is happy." So says Ishana Bai of sharing your abode with a ghost. Though she exudes a witch-in-the-woods kind of feeling--thanks perhaps to our meeting at sunset two weeks before Halloween in her West Side Santa Cruz studio, where woven baskets, pottery bowls and the scent of sage endow the twilight with a deliciously earthy feel--Bai insists that what she does is no big mystery. "It's not black magic," says Bai, who speaks with a hearty German accent, drives a Gypsy wagon and likes to live outdoors so she can listen to the coyotes yipping. "It's on the quantum level, not in matter, though it manifests on that plane. It's not another cult, not another spiritual group, but just humanity achieving its full potential." Unlike most Americans who only think about the dead once a year--and then mostly in the context of candy and costumes--Bai says she is in constant contact with spirits. But it wasn't always that way. After apprenticing and doing a journeymanship as a potter in Germany, she came to America and did a lot of shamanistic work . "I love my feathers, my drums and chanting, and I've probably always have the strength to channel, but truly my intuition came clear through studying the Yuen method," she says. "It changed my whole life." To Bai's mind, there is no such thing as a positive haunting. "When a spirit is between worlds, it wants to go over. Sometimes a spirit can live like that for hundreds of years. With the Yuen method, we can flick a finger and bring it over to the other side. We can 'see' these things, sometimes even better than with our eyes," she says. Bai says sometimes the subjects of hauntings are carrying "negative karma" with them. Other times, she says, spirits may be seeking help--for instance, the ghost of a mother who has lost a child may come to the bed of another child, night after night, until set free. "Eventually the person who usually has to write the Halloween story for Metro Santa Cruz won't be there, because everything will have been cleared up," she predicts. From the October 29-November 5, 2003 issue of Metro Santa Cruz.